For a starting MSRP of $44,300*, the 2019 Acura MDX includes a generous selection of luxury features and ample cargo space. The Acura interior is known for its comfortable and upscale feel, and it’s represented in the new MDX. Look below to see what types of features await Salt Lake City drivers inside its cabin! Behind the third row, you’ll find 15.8 cubic feet of cargo volume. Folding the third row down expands that figure to 43.4 cubic feet. Need more space? You can fold down the second row for up to 90.9 cubic feet. Whether you’re taking a day-trip with the family or moving house, the MDX offers space for just about any lifestyle. Sport Seats: The sport-contoured seats help keep you comfortable as you commute through Draper, while adding an athletic touch to the cabin. 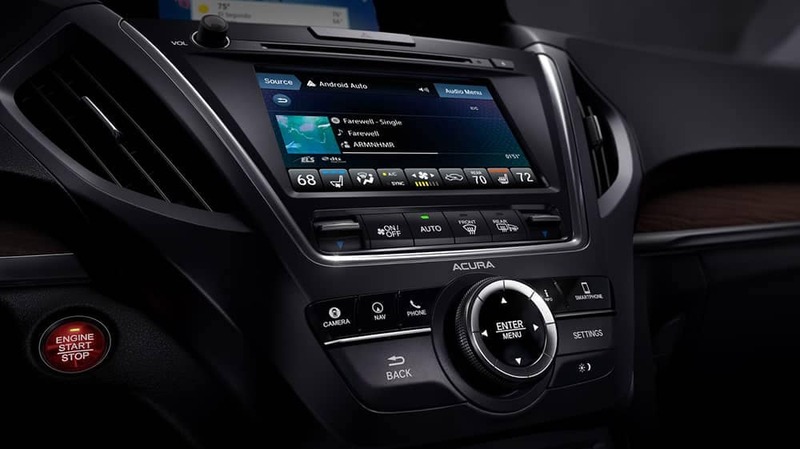 Apple CarPlay & Android Auto: Connect your compatible smartphone to the infotainment system, so you can access your favorite Apple or Android apps via the standard 8-inch touchscreen or voice control. HomeLink: With HomeLink, you can program your garage doors or security gate to open at the touch of a button. Acura Navigation System with 3D View: When you choose the MDX Technology Package, you’ll get the Acura Navigation System—a fast, intuitive feature with voice recognition, 3D viewing, and Real-Time Traffic. GPS-Linked Climate Control: This system uses GPS to pinpoint your location, and adjusts the climate system based on weather conditions in your area. Acura/ELS Studio Premium Audio System: This advanced sound system plays your favorite tunes using 10 speakers—two tweeters, one center mid-range, two rear-seat surround, and one powered 8-inch subwoofer. Does the Acura MDX offer the interior features and space you want? Compare this model to others in the luxury SUV lineup to make your decision. Then, contact us online or by phone with questions about the Acura MDX, or what’s trending here at Mike Hale Acura near Provo! 0 comment(s) so far on What’s Inside the 2019 Acura MDX Interior?